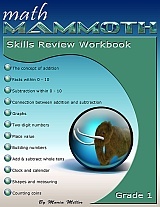 Some students benefit from spiral review, and that is exactly what Math Mammoth Grade 1 Skills Review Workbook offers! It has been designed to complement the lessons in Math Mammoth Grade 1 complete curriculum, providing spiral review of the concepts in the grade 1 curriculum. 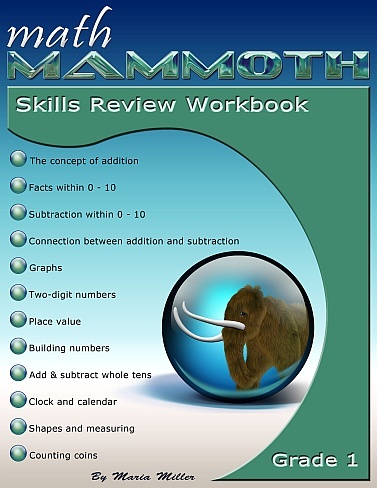 Math Mammoth Grade 1 Skills Review Workbook is divided into chapters, which correspond to the chapters in Math Mammoth Grade 1 curriculum. It is meant to be used during the school year, alongside the main curriculum. Spiral reviewing means that after a particular concept or skill has been studied in the main curriculum, it is then reviewed repeatedly over time in several different worksheets of this book.